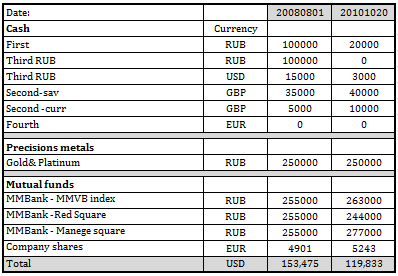 As you can see the actual position worsened from 2008 to 2010 by nearly US $35 K. About US $30 K was due to the dollar is stronger than ever before towards EUR, GBP, RUB. Where I want to be: Looking at the crisis outside I would define financial independence as following: US $60 K USD a year if the principal is generating 3 % a year., i.e. 2 million dollars in today money. The question is who to get there? The only way to reach my target by 2019 is by saving US $100 K a year and count on interests rate of 5% for generating for the rest of my life. For 3% a year I need be able to save US $180 K a year. Obviously both savings rates are not realistic, with my current level of income. There is no silver bullet - only diligent saving & time. Effectively if I would not buy the properties and invested them now, with contribution US $40 k a year and growth of 5% I could reach the goal by 2026. Perhaps this is something like a cold water shower in the morning and very sobering reading but it is the only way out, as far as I could see. Time is on an essence - should I stop my annual contributions in 2019, I would still reach my goal by 2044, but if will I continue to do so, I would double my target in 2044. Funny thing is, that should I invest only 100 K US today, by 2045 I would be better off than my parents today (they are retired on a stated pension - 2400 US a year) .